SAME DAY SHIPPING Cut ferrous metals (mild steel) faster, cleaner and easier. Save time, money, the environment, and your respiratory health. 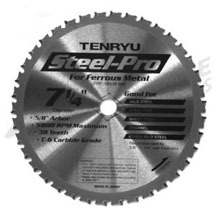 TENRYU�S complete series of steel cutting saw blades called �Steel-Pro�� makes light work out of all kinds of mild steel: steel studs, steel sheet, steel pipe, channel, threaded rod and much, much more. Specially formulated C-6 carbide grade, combined with our unique tip design, resists breakage on impact and lasts longer, much longer than standard carbides or abrasive discs. 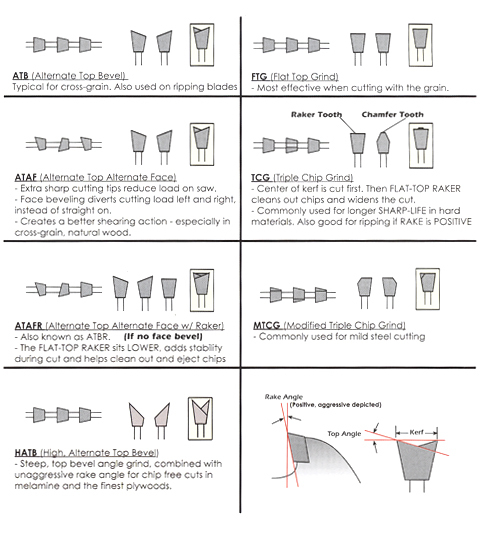 Special tooth geometry with �inserted� tooth design greatly improves security of the tip, effi ciency and durability. Abrasive discs throw sparks and lots of dust including unhealthful fi berglass. You shouldn�t be breathing it in! Steel-Pro� blades reduce spark production and eliminate abrasive wheel dust. Abrasive discs wear quickly, requiring frequent blade changes. Steel-Pro� blades allow you to keep working; eliminating down time for frequent blade changes. In addition, Steel-Pro� cuts 5 to 10 times faster than abrasives. Typically, one Steel-Pro� blade will outlast somewhere between 15 to 30 abrasive blades. Think of all that non-productive �down time�. Abrasive discs leave a sharp burr at the cutting edge that must be removed later. Steel-Pro� blades cut clean; eliminating this extremely time-consuming after-cut process. �Time is money�. Steel-Pro� saves you BOTH!